There have been a number of stories recently about the number of doctors heading overseas but they are usually sensationalist and lack context. The most important questions are how many doctors do we have working in New Zealand, and how does that relate to the size of the population? Fortunately, the Medical Council produces an annual report on the number of active doctors. And, guess what? 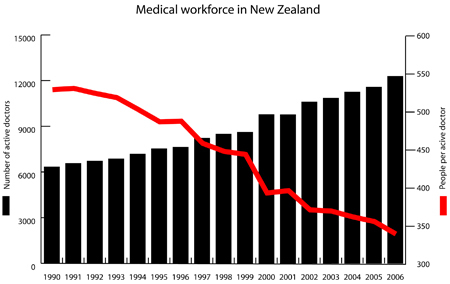 The number of doctors working in New Zealand is not only increasing, it is far outstripping population growth. Would it be great to have more doctors, retain more New Zealand-trained doctors, and pay doctors more? Yes, yes, and yes. Does the fact some New Zealand doctors are heading overseas mean we’re running out? Doesn’t look like it. Why is the red line portrayed more dramatically than it really is? STC, basically because it looks cool. It’s not a party political thing – the Nats have quite a good record on active doctor numbers too. The ratio of people per doctor has fallen 35% in 16 years, that’s a good news story in my book. What is the quality of doctors like compared to 10 years ago, I bet it is lower. Numbers do not telll the whole story. Is this primary doctors suc as in hospitals, GP etc. Also, does this figure include doctors that offer services such as Botox etc as this would skew the figures. These have increased a lot in the past 10 years or so. Tane: while the red line may look cool, it is very deceptive. The right axis should begin at 0, just as the left one does. It makes it easier to gauge the true proportion of the decrease. the fact that it’s so surprising is a real tribute to the tragedy of our msm. Chemist Peter. Assuming doctors have got worse over the last 16 years is stupid and basless. I though you were a scientist, you should know you need evidence. About the scale for the red line – you don’t always need a scale to go to zero, especially if a) it can never realistically approach zero and b) you’re trying to show variation over time more than the size of the specific value at any point. But graphing is a bit of an art and it is open to deceptive tricks, of which mucking around with scales is one of the oldest in the book. Steve nice kneecapped graph which you made up . Is it correct that nearly 2000 New Zealand trained doctors don’t have practising certificates, and that the numbers of GPs in 2006 is below the number in 2000. Wow the kiwiblog right are really at it today. It is a graph, how ever wide and how ever tall you make it, it says EXACTLY THE SAME THING. Sure if DPF was posting this he would, for some unknown reason of course, accidently have the graph come up at twice the width of everything else on the page, and i’ll get around to fixing that up later, very busy right now. dave, maybe Steve can do a better job kin explaining this, he’s the graph whizz and all, but for what it’s worth: the black bar is higher above the numbers ‘2006’ than it is over the numbers ‘2000’ so I think that means that there are more doctors in 2006. It is pretty hard to tell though eh, they don’t teach graph reading in kindy like they used to. Have you got any form of substantiative rational discourse to add, especially regarding your claim about doctors without practicing certificates, or did you just hear that from your mate at the local? I’m going to assume the latter. dave. the source figures are here http://www.mcnz.org.nz/Publications/Statistics/tabid/83/Default.aspx you have no grounds to say I made them up. 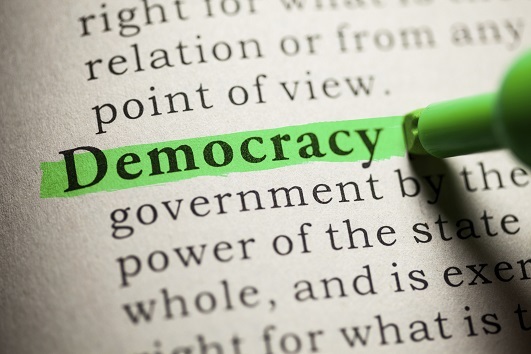 Note, there is a step change in 2000 due to a change in reporting practice, but the pattern is clear – numbers are growing faster than the general population. Told you he’d do a better job than I at explaining it. Steve – technically, was I right? the bit about one black bar being higher than another black bar meaning that there were more doctors? lower red line = fewer people per doctor – ie more doctors as a portion of the population. look just redo the graph willya…stationary dave would love to sell more paper if everybody prints it out twice…he’s not fussy about the truth either if it comes down to selling paper! Good to see you`re finally out of bed. I was with my mate at the local and we were chatting about this just before you got out of bed. Ironically enough he had the report that Steve linked to and on that report on page 5 it said that there were 3166 GPs in 2000 and 3106 in 2006. When I went to school 3166 was a higher number than 3106. Even today 31656 is a higher number than 3106. That means there were more GPs in 2000 than there are in 2006. Funnily nenough he also had the 2006 NZMC annual report. THat report says that nearly 2000 New Zealand trained doctors don’t have practising certificates. Which is what I said. Now, back to bed, Matthew. Oh an another thing you forgot to mention Steve, You never advised how many hours an “active doctor” has to be employed to be classed as an active doctor and categorised in your graph. I`ll give you a clue: its less than 5 hours per week. or c) you’re no better than the people you like to rally againt. By the way, I never did see you admit you screwed up with your assertions when you posted that OECD tax graph. Perhaps now is the time to come clean? Or do you just want to be regarded as a hack? Your choice.